This is the last post for Christmas in July! I hope you’ve been enjoying the projects and found some that you’ll make this year. 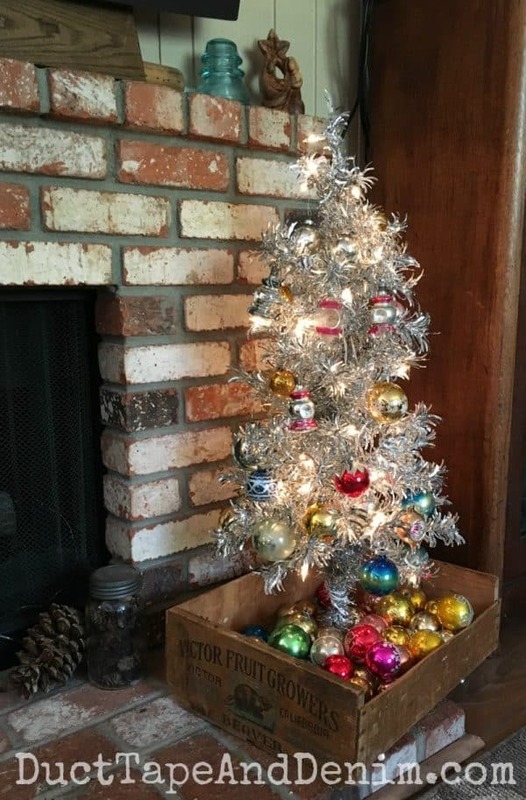 Today I’m sharing my little aluminum Christmas tree from last year along with lots more ways to display vintage Shiny Brite ornaments. If you need more Shiny Brite, you can find just about every style PLUS original boxes on Etsy. Shiny Brite Cola Crate — You know I also have a weakness for vintage wood crates, right? 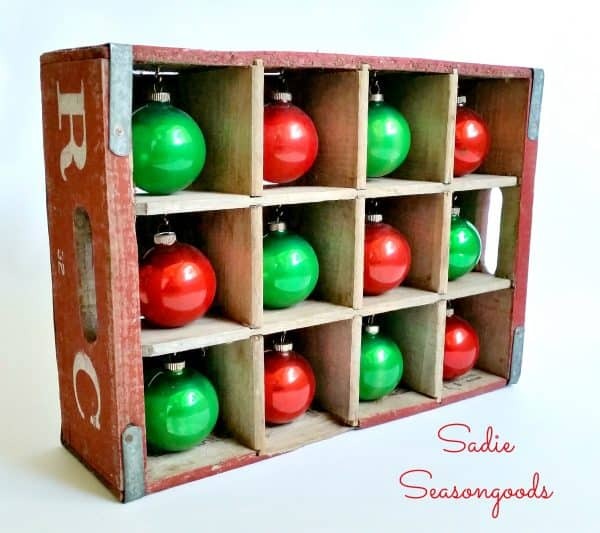 Well, Sarah combined the two, making a Christmas decor piece that I’m drooling over! 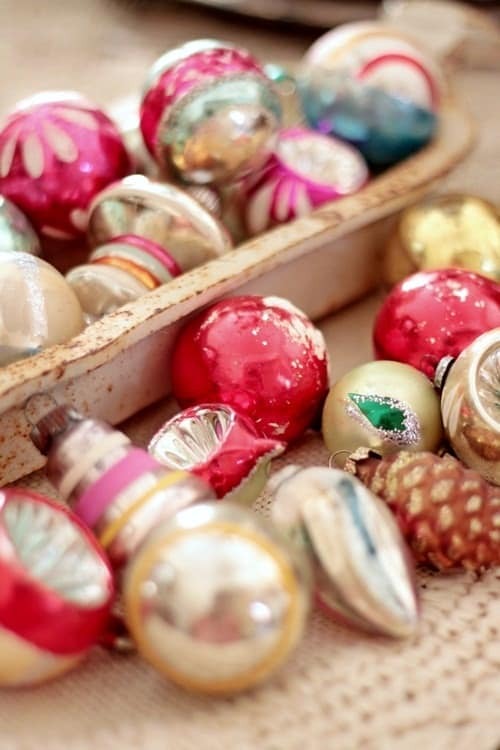 Fill a Bowl — I have more glass balls than fit comfortably on my tree. Many years I’ve just filled a bowl on my coffee or dining table so that I could look at them during the Christmas season. 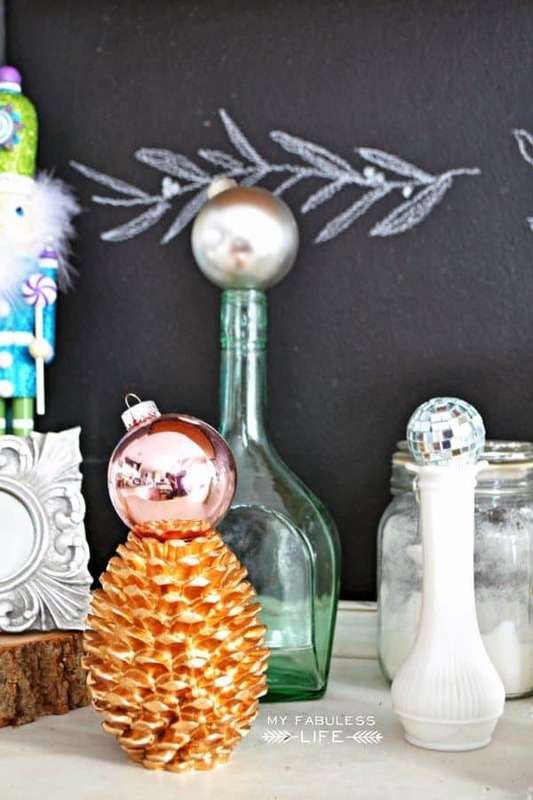 This blogger filled a slightly rusty bird feeder with delicate, old Shiny Brite ornaments. You’ve really got to go over to this post to see the details of these beauties!!! 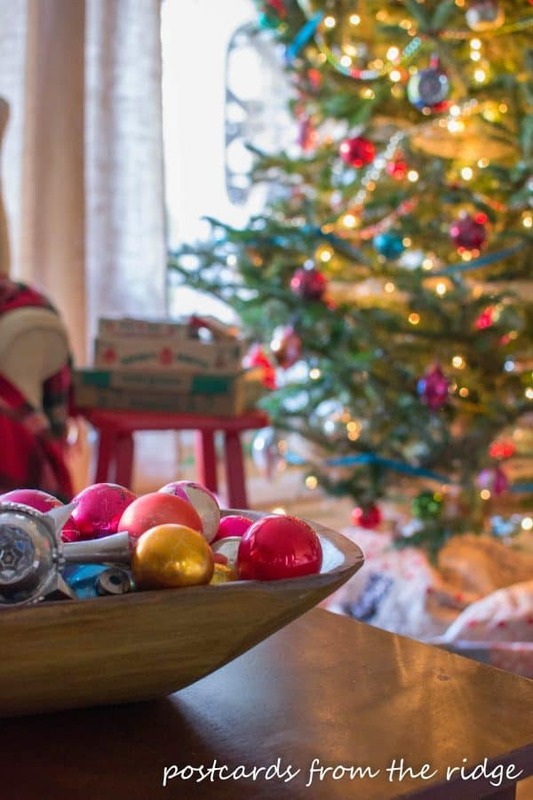 Put Shiny Brite Ornaments on a White Christmas Tree — I’m usually a fan of traditional green Christmas trees. But this white one creates a great background for the beautiful colors of vintage glass balls! 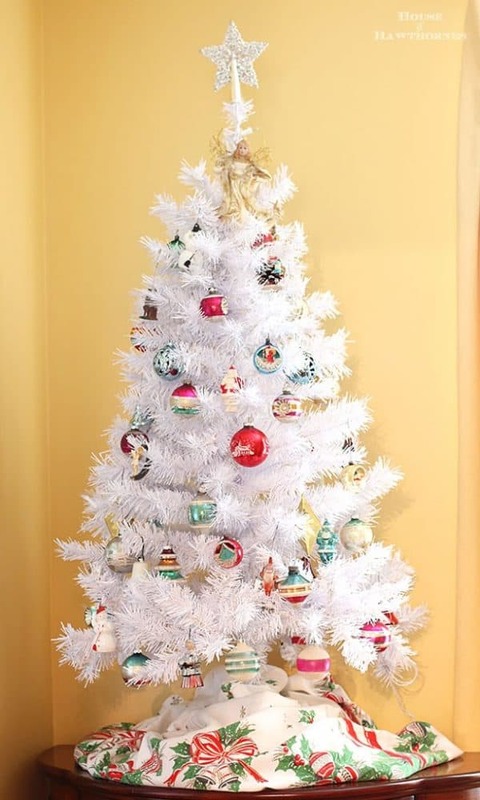 Here’s another, even brighter, example of Shiny Brite ornaments on a white Christmas tree. This one is a white Christmas tree with LOTS of tinsel! White Christmas tree in the kitchen. 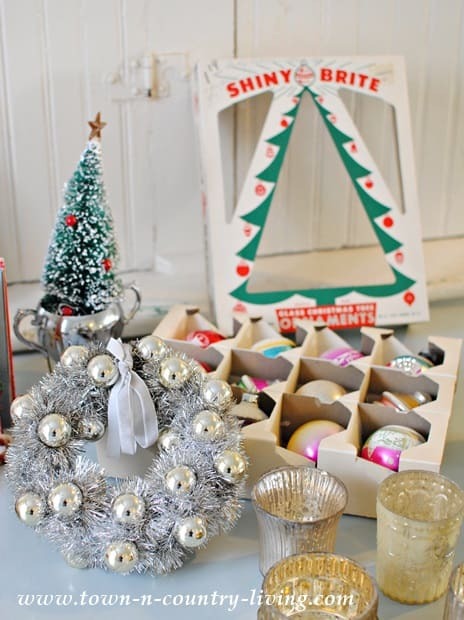 Display Shiny Brite Ornaments in the Box — The graphics on the old boxes make sweet Christmas decorations, too. Just leave the balls in the box and set it out for everyone to oooooooh and aaaaaaah over! 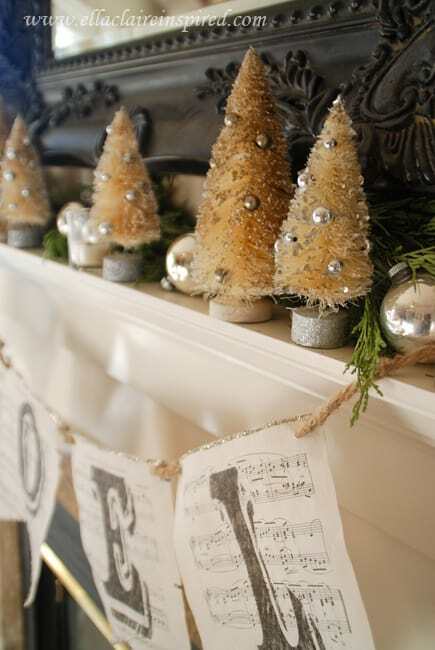 Add Shiny Brite Ornaments to Your Mantel — Anywhere you have a little blank space, just add an ornament. Balance Shiny Brite Ornaments on Vases, Bottles, or Candlesticks — This would be a lovely way to display my milk glass vases at the same time! Love these in front of the chalkboard, too! Fill a Jar with Shiny Brite Ornaments — Sorry for the poor quality of this photo. It’s from my Room With a Past shelf many years ago. But I just had to show you how many pink ornaments I had that year! Thanks for reading my blog. 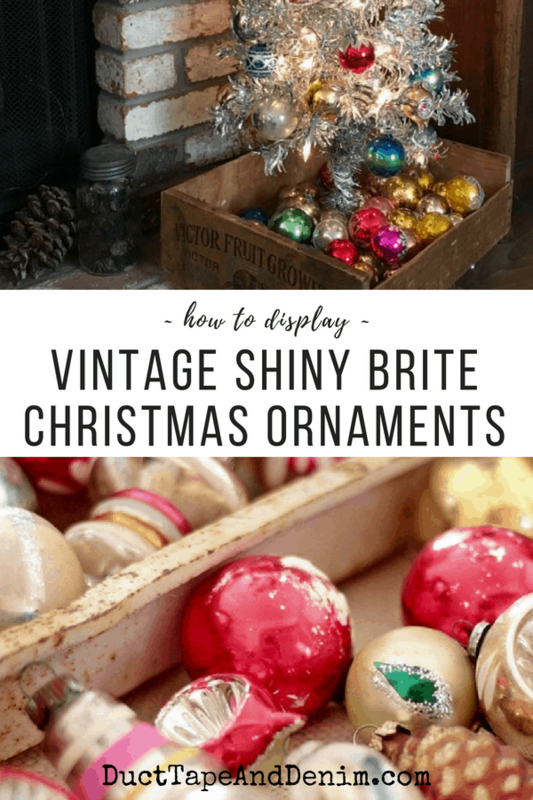 I’d love to hear how YOU display your Shiny Brite collection. Leave a comment and let me know. Thanks! Originally published July 29, 2016. We join these blog parties. « We Finally Made it to Magnolia Bakery in Waco Texas! I love how you put the loose bulbs at the base of the tree. I’ve often displayed extra bulbs in bowls and vases but this is so unique. Love all the others you shared too, especially the white tree,. One day I’ll have a white feather tree, maybe I should get busy making my own ???? I only have a few that are actually Shiny Brite, but I have several glass balls of various colors & designs. I always choose a few to display on crystal candlesticks on the kitchen mantle. I put a string of white lights winding among the bases. The lights really make the crystal & the balls sparkle & shine! 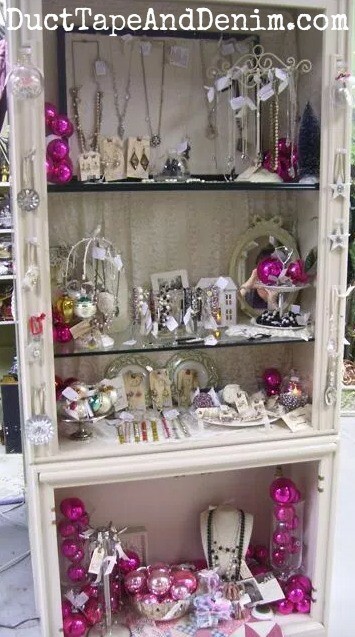 I also put some in glass bowls, or pretty Christmas sleighs. I really like the idea of using a white tree to really make the colors stand out! Question if I may? Is there a way to clean or shine antique bulbs without washing off hand painted designs? Is there any way to coat, dip or spray these bulbs to protect the outside surfaces? Karen, Thanks for the question. I’ve never tried cleaning them. Other than just wiping them off with a rag. I’ll have to look into that. Thanks for all the ideas about using the old Shine Brite glass ornaments. I have a large storage box full of the ones handed down in our family, some from my great-grandparents’ home. A few have been broken and I will definitely try stacking them in containers so that their good sides show and the damage is hidden.